Make history as the legendary Master Assassin, Ezio Auditore da Firenze, in Assassin’s Creed® The Ezio Collection, which includes the acclaimed single-player campaigns and single-player add-on content* from Assassin’s Creed® II, Assassin’s Creed® Brotherhood, and Assassin’s Creed® Revelations with enhanced graphics for Xbox One and PlayStation®4 system. Assassin’s Creed II – Ezio’s saga begins as you fight and explore the open world of the Italian Renaissance in an era of art, riches, and murderous conspiracy. 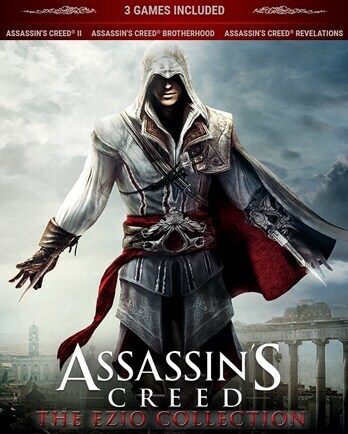 Assassin’s Creed Brotherhood – Journey into Italy’s greatest city, Rome, the centre of power, greed, and corruption, as Ezio takes leadership of the entire Brotherhood of Assassins. Assassin’s Creed Revelations – Two Assassins, one destiny. Embark on Ezio’s final adventure as he walks in the footsteps of his great mentor, Altaïr, on a journey of discovery and revelation in 16th-century Constantinople and the heart of the Ottoman Empire. Best game in EZIO's COLLECTION. Paris, 1789 – The French Revolution turns a once-magnificent city into a place of terror and chaos. Its cobblestone streets run red with the blood of commoners who dared to rise up against the oppressive aristocracy. As the nation tears itself apart, a young man named Arno will embark on an extraordinary journey to expose the true powers behind the Revolution. His pursuit will throw him into the middle of a ruthless struggle for the fate of a nation, and transform him into a true Master Assassin. Introducing Assassin’s Creed® Unity, the next-gen evolution of the blockbuster franchise powered by the enhanced Anvil engine. From the storming of the Bastille to the execution of King Louis XVI, experience the French Revolution as never before – and help the people of France carve an entirely new destiny. Play as Arno, an entirely new breed of assassin, and take down your prey with a range of new weapons such as the phantom blade, a hidden blade with crossbow capabilities. Enjoy an unprecedented degree of freedom and control over your assassin. Full Motion Control with New Parkour Mechanics for Free Running Up, Across and Down City Walls and Buildings. A reinvented fighting system provides a richer combat experience based on skill, timing and flow. Enhanced stealth gameplay, including a new stealth mode, cover system, and crowd-manipulation techniques. Craft a unique play style by choosing weapons, gear, outfits and specialized skills. Mix and match from hundreds of possible combinations and build your stealth, fighting and navigation abilities from a new, expansive skill tree. Carve through the stunning full-scale open world city, a feat only made possible through the power of an all-new game engine. In addition to an epic Singe Player campaign, join up to three friends and experience the online open world of 18th century Paris. Pull off ambitious Heists and take part in unique narrative driven missions designed exclusively for cooperative play. Sabotage an execution. Protect an emperor. Assassinate a Templar agent. But victory won’t be easy; you and your lethal band must rely on communication, coordination, and diverse skills to accomplish your missions, then vanish into the shadows. London, 1868. The Industrial Revolution unleashes an incredible age of invention, transforming the lives of millions with technologies once thought impossible. Opportunities created during this period have people rushing to London to engage in this new world, a world no longer controlled by kings, emperors, politicians, or religion, but by a new common denominator: money. Not everyone is able to enjoy the benefits of this boom, however. Despite fueling the engine of the British Empire, workers’ lives are little more than legalized slavery while the top few percent profit from their labor. Living poor and dying young, the lower class unite in protest as a new kind of family, gangs, who turn to a life in the underworld in their struggle to survive. A struggle, until watchful Assassins come to their side and re-ignite an age-old conflict involving London’s leaders that will echo throughout modern history, from the underground up. As the brash, rebellious Jacob Frye, put up your dukes and take enemies on with lightning-fast multikills and countermoves. Use improved stealth tactics to elude your enemies and unleash your arsenal of weapons, including the kukri knife, brass knuckles, and sword cane. Utilize new technology like the rope launcher to scale buildings in seconds and take your enemies by surprise.